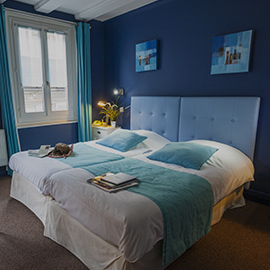 Pleasantly located in the city centre of Strasbourg, the EtC… Hotel is halfway from the unmissable Strasbourg Cathedral, the picturesque Petite France and the Kléber square with its shops. The hotel offers a contemporary and particularly friendly atmosphere. Its location in the heart of the Grande-Ile is an invitation to discover the Alsatian capital, its numerous monuments and tourist attractions. A few steps away from the Cathedral, the hotel is the ideal departure point for a walk along the Strasbourg embankments or in the historical city centre. You will discover the various aspects of a city that has preserved its soul, an urban mesh of traditions and modernity. For a weekend in Strasbourg, for your holidays, or your professional stay, as a couple or as a family, the Hotel EtC… will be happy to welcome you. Our helpful staff will make your stay a special one. You will immediately feel at home in this charming building. The hotel has a pleasing modern and cosy atmosphere, a sober and neat interior decor, with colourful and original accents. Our 35 comfortable rooms invite you to relax and rest during your stay in the city centre. The rooms feature different warm and vivid colour schemes that set the tone of the hotel. You will be staying in a colourful and charming atmosphere that will contribute to a pleasant and original stay. “Urban Metal”, “Earth and Mist”, “Sky and Water”, “Sun and Fire”, choose the room that suits you best, for a stay that resembles you best! EtC… your hotel in Strasbourg, and more! Our staff provides friendly and personalised service to give your stay the “little extra” that makes the difference. Comfort, proximity, and smiles combine to make you feel at home!